Nadia Pym is the daughter of the famous Hank Pym, but she has never met her father. Due to tragic circumstances she has spent most of her life locked up in the Russian Red Room, a place meant to foster (and enslave) promising young Russian minds. Like her father, Nadia is a natural when it comes to science and when she is finally freed from the Red Room, she takes her talents to New York City to work some good for the world. She meets everyone’s favorite teenage superhero Ms. Marvel, and along the way runs into her idol Mockingbird. Amidst saving the day from an evil genius and her robot, Nadia and Mockingbird hit it off. From start to finish this issue is a blast and a ton of fun to read. This is due in no small part to the character work Jeremy Whitley does with the character of Nadia. From the very first page of this issue it is apparent that Nadia has a lust for life and enthusiasm for science and kindness that is impossible to dislike. Nadia has every reason to be angry at the world – locked in the Red Room all her life, missing parents, institutionalized sexism in her field of choice – but she doesn’t let that get her down. She is defiant in the face of all of these hardships and frequently shows she’s an endearing and amazing individual. She easily makes friends with store clerks, gives food to strangers, saves New York, and laughs off any would-be naysayers. This eternal optimism is best on display when after defeating Monica Rappiccini and her “megazord,” Nadia gets a chance to chat with her science-idol: Barbara (Mockingbird). Nadia is a lot of things, but reserved is not one of them. When she is excited about something, she shows it. Here she can’t help but gush about her admiration for Bobbi and the groundbreaking research she has accomplished. That enthusiasm is endearing and it’s impossible to not like a person who can get so excited about science. This scene also shows how Nadia’s enthusiasm rubs off on others. Meeting a girl who respects Barbara for her science first and superheroing second means everything to her and reduces her to happy tears. This interaction shows how Nadia’s enthusiasm is not not infectious, but genuinely moving and important to the people she meets. From the start Nadia is a wonderful character and its incredibly fun to spend time with her on her adventures. It’s not easy to make a character so immediately likable but Whitley seems to do it with ease. At no point does Nadia’s positive attitude feel forced or fake in this issue. It reminds me of the work Ryan North has done with Doreen Green in Squirrel Girl, only different, yet no less charming. But Nadia’s character isn’t the only thing that makes this a great first issue. Elsa Charretier’s pencils are a marvel, animating fun action scenes and engaging character interactions. The page that introduces us to Monica’s “megazord” stands out as being a particularly well-composed page for several reasons. What first stands out is how Charretier has inserted panels along the top of the page. The manga inspired shaped panels include interjections from every character involved in this scene and quickly establishes that they are in a common area. More than that, though, they all cleverly point to where the main action of the panel is taking place, namely Mockingbird attacking the giant robot. This is a neat technique that guides our eyes to the most important part of the panel. Yet even though this is where the primary action is taking place, Charretier guides our eyes to other important parts of the page. Using Nadia’s science vision (wherein she analyzes the construction of Monica’s robot) Charretier guides our eyes to the bottom of the page for some further dialogue. This effectively takes what starts out as a single panel splash page and breaks it up into three distinct parts, almost like three separate sets of panels. That all of the eye movement feels natural without the need for traditional paneling is a testament to Charretier’s skill planning the layout for her comics. There are other examples of where Charretier work similar wonders in this issue and each is just as stunning as the last. Suffice it to say, this first issue is fantastic not only because of the wonderful artwork but because of the wonderful character building taking place with our main character. Ryan, what stood out to you about this issue? I was genuinely moved at the end of the issue when Barbara and Nadia were talking about redefining lists of the “smartest people in the world.” What was your reaction? Also there’s just really so much great stuff happening in this issue that I’m curious to see what you really liked as well. Or, was there anything that fell flat for you? Ryan M.: Taylor, I agree, the list was a pretty powerful way to connect Bobbi and Nadia as well as give the series some kind of larger arc. Nadia is the perfect person to head up GIRL, because while she was a prisoner and kept from the things a typical girl takes for granted, Nadia was given access to the world’s scientific knowledge, encouraged to experiment, and reminded every day of her potential. Nadia’s mission that includes fostering the best and brightest girl geniuses to make the world a better place, is inspired in itself. It’s impressive that Whitley and Charretier are able to fit so much into this single issue. In addition to her new mission, we get a view of Nadia’s affect on people in her daily life, a big battle, and her connecting with a childhood hero. Oh, and there’s also a fairly detailed backstory that explains her entire history up until this point. It’s a lot, but it never feels rushed or like information is being thrown at us too fast. Part of that is because Whitley has such a handle on Nadia’s character that each part of the story feels united by the optimistic scientist in the center. When Nadia confronts Rapaccini, she does so with the same attitude of optimism and excitement that she uses to face every aspect of her life. This battle sequence works for the story in a several ways. It establishes that Nadia’s scientific problem-solving is applicable to the kind of surprise confrontations that she is likely to face a superhero. Whitley sets the stakes for the book. This is the kind of story where a big robot is operated by a crazy scientist with unclear motives and is resolved with the scientist living to fight another day and the heroes going to get smoothies. That level of combat contextualizes the series and gives us a frame of expectation. Nadia is going to have fun adventures that can be solved by rational thought and will face them with a sunny disposition. Taylor, I know you already praised the composition of these pages, but I have to second it. 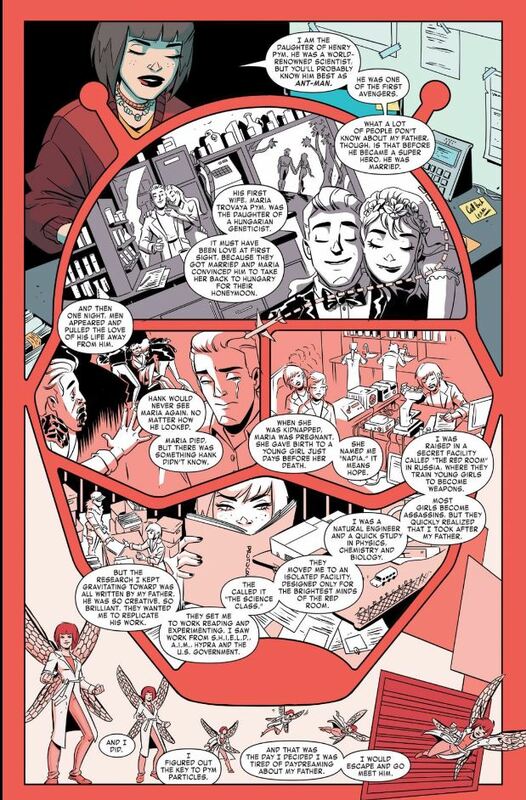 Charretier balances a hefty backstory by using an Ant-Man helmet to contain most of the story. The eye naturally flows chronologically through the story, helped along by small touches such as the airplane that flies between panels. The use of color also adds another level to the story or at least Nadia’s perception of it. The first part of her memory is in black and white and features her parents in love and loving science. The coloring suggests a vintage film and even Nadia’s language has a kind of wistful romanticism to it. It also has the sense of a story retold, which Whitley makes clear. Nadia’s language becomes much more specific as she shifts into her own experiences. The coloring shifts to shades of red and white. Whitley writes Nadia as honest but not dwelling on the more unpleasant parts of her history, but it’s still an upsetting story. In order to give the reader a moment to recover, Whitley gives us a moment with the weepy immigration officer. When Nadia comforts the woman and explains her positive attitude, it’s as if Whitley is teaching the reader how to view Nadia. She is not a victim of her horrible circumstances. She is an awesome, super-smart scientist who is going to face the world with openness and joy. Maybe Nadia’s attitude is infectious, but it’s hard to come up with any real criticisms for this issue. It establishes a refreshingly positive character getting ready to embark on a new adventure and I’m excited to go on it with her. Here’s a question? How do you think that the very existence of Netflix has changed the media at large, and comics in particular? The effect of the Jessica Jones show on Marvel is very clear. 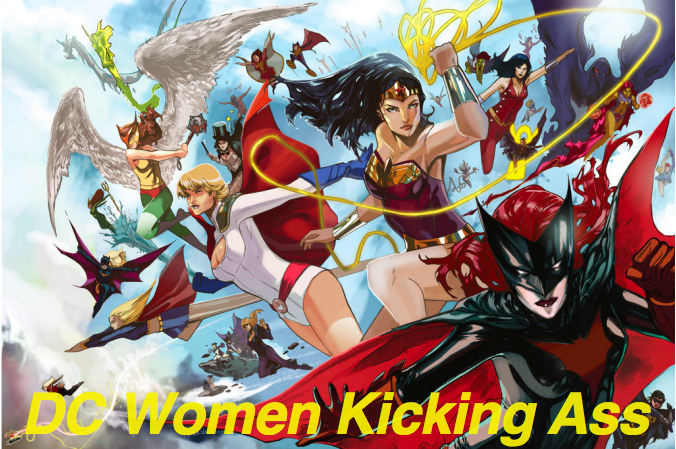 Hawkeye, Hulk, the new Jessica Jones comic and Spiderwoman all owe a debt to the Jessica Jones TV show. But it also feel hard to discuss Unbreakable Wasp… I mean Unstoppable Wasp, without discussing Kimmy Schmidt. Kimmy Schmidt is a show that would not be able to exist as it does without Netflix. It is a brave show. The choice to explore such a dark idea as a bright, sunny sitcom was something so risky that NBC refused to pick it up. But Netflix has turned it into a success, as Netflix have with many other seemingly risky picks. And now Marvel’s next big hero is basically superhero Kimmy Schmidt. Though this is not to say that this book isn’t pure Jeremy Whitley. Woman pissed off at the way the world denigrates women starts a mission to break patriarchal expectations of how woman are treated, going on a quest to find women facing similar oppression? That is either the description of Unbeatable Wasp or Princeless. Jeremy Whitley has been doing fantastic stuff for Marvel lately, in the background. So the chance to see him in a proper book was so great. And yeah, he kills it. The most important thing is that Nadia comes across as sincere. It is actually really clever to show her so positive about something like donuts (actually balushahi, but the point still stands). It is a relatively common trope, so we get eased into Nadia’s perspective so that by the time she’s things like ‘Well, if I spend the rest of my life being bitter, then I never really escaped, yes?’, we understand her enough not to find such a response impossible. Instead, her optimism and enthusiasm is utterly infectious. What I love the most about it is how it serves two different purposes. Firstly, it truly shows Nadia’s ‘seize the day’ epidemiology, and builds the idea of loving life. That every individual moment is too important not to be spent trying to make things great. Don’t be a slave to your past, and instead spend every moment you can being awesome. But the fact that Nadia is enthusiastic also helps make science seem like the coolest thing ever. I could read Nadia talking about robot engineering for an entire arc. Unstoppable Wasp wants to inspire science a love of science in women (which is why they awesomely have female scientists being interviewed at the back). Also, the use of Mockingbird in this issue is genius. While Chelsea Cain did a fantastic job at showing Bobbi as a scientist, including building the very climax of her first arc around that idea, Bobbi’s scientific credentials are so often ignored. Outside of her own book, when was the last time that you seriously remember Bobbi’s biologist qualifications being brought up. Lots of people will write her as an expert spy, but the idea of her being a genius scientist among the ranks of your Richards, Banners and Pyms is something ignored. Hell, my first thought when I saw her appear was that Whitley wanted to use her out of respect of Cain’s fantastic series, not because she is a scientist (I do find it interesting how there are some contrasts in how Bobbi is shown. Cain went for completely unflappable, pure confidence. But also acknowledged that she would never get the recognition she deserves because of sexism. Bobbi certainly isn’t unflappable here, but getting actual recognition is so refreshingly different you can understand her breaking down). There is so much more I could say (the emphasis on Nadia reading scientific papers is actually clever), but this is a great start. On occasion, there is clunky dialogue, as I expect from a Whitley project, but this is a great start to the series. Can’t wait to see what happens next. Slightly worried that the same thing will happen as what happened with Hawkeye’s second issue, but if this book could maintain a good consistency with the stuff it is playing with now… Things could look very bright.